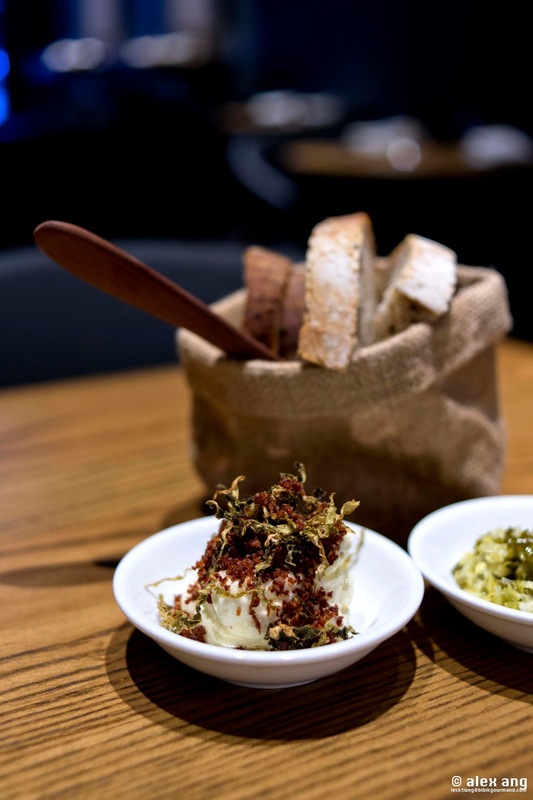 The bistronomy movement has taken cities like London and Paris by storm but in Singapore, the seats are just warming up with Sorrel’s debut six months back and Cure making its much-anticipated entry at Keong Saik Road last week. The rationale for the anticipation is simple. 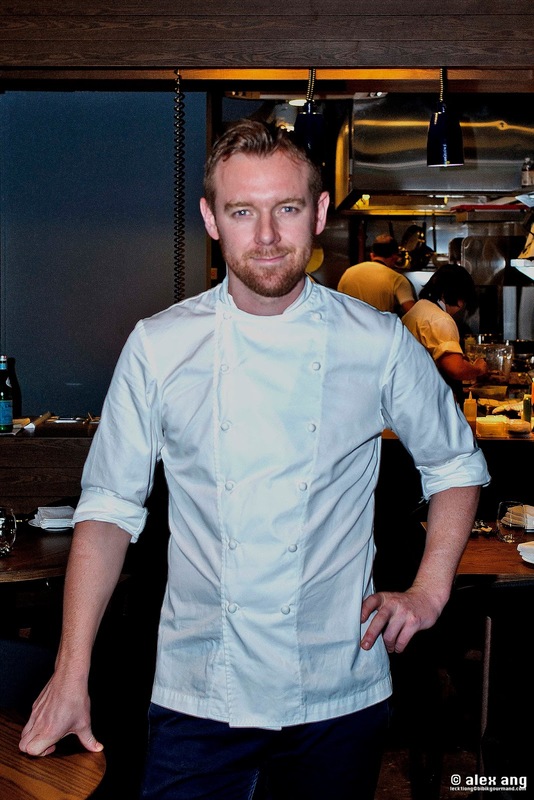 Former Esquina head chef, Andrew Walsh, has washed his hands off small plates and traded them for ‘haute’ but affordable tasting menus that put the spotlight on seasonal ingredients – predominantly British and Irish produce. 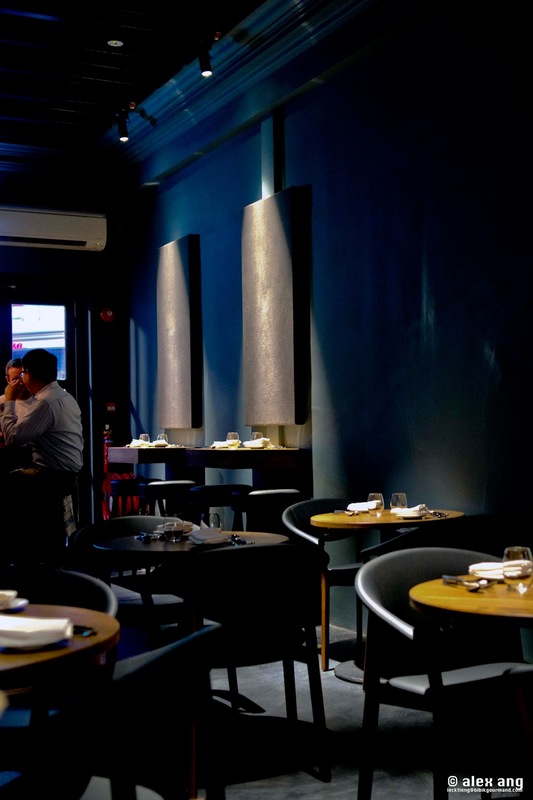 If this brings to mind fine dining, Cure’s quietly austere shop house setting actually looks the part, think a gorgeous – albeit minimally embellished – interior with charcoal grey walls adorned with enormous planks of grey canvases. Probe further and the menu will show you otherwise. On weekday nights, Walsh fields a monthly-changing 4-course tasting menu priced at S$95++ and on weekend nights, it’s 5 courses at S$110++. A vegetarian tasting menu is also available upon request. Like the fine diners, Walsh is generous with the extras like snacks, a complimentary pre-dessert and petit fours. 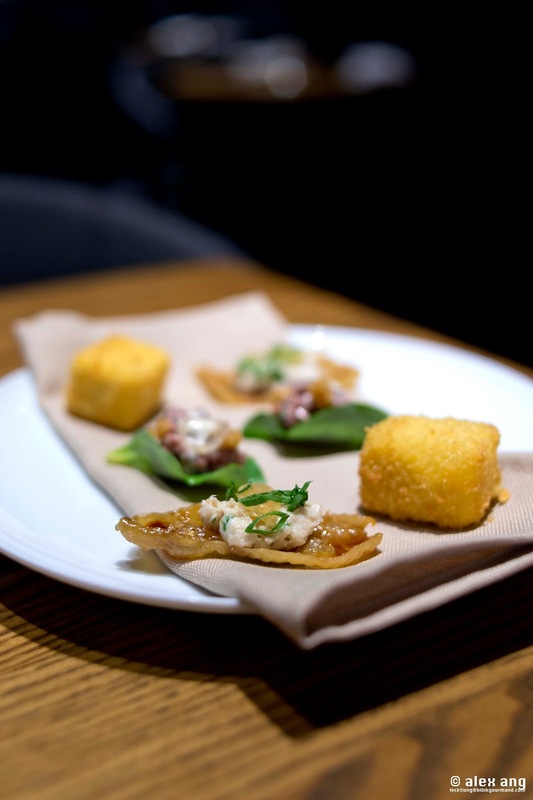 During our visit, snacks appeared as a trio of pop-in-the-mouth delights – Galway Bay oyster paired with British beef tartare on a blade of oyster leaf, chicken skin teriyaki with pickled ginger and a morsel of croquette that burst forth with the sweetness of sweet corn. Bread service, which arrived with fermented cabbage and bacon butter (both cabbage and bacon are staples in the Irish diet), was equally – if not more – impressive. Of note was the dangerously addictive house whipped butter with rendered bacon, which was begging for multiple top-ups of the breadbasket. Walsh’s bistronomy cuisine is produce driven. It is evident from his plating, which puts the spotlight on no more than 3 to 4 key ingredients at any one time. 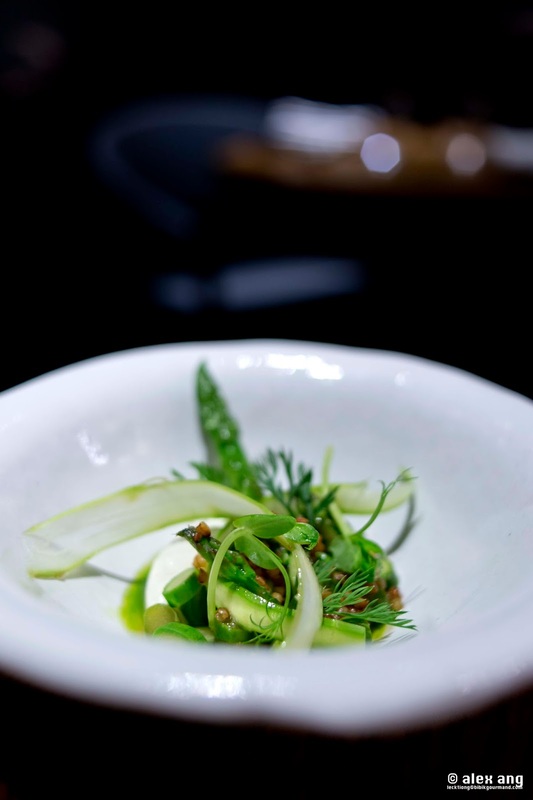 During our visit in July, spears and shavings of lightly poached asparagus were teamed with a quenelle of house made ricotta, pearls of toasted buckwheat and Comte mousse for a light, smoky and creamy finish. 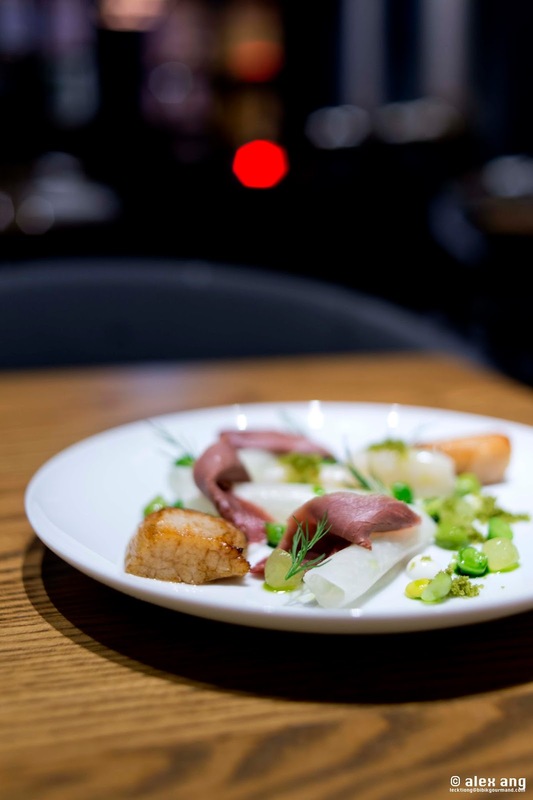 Scottish scallops were served two-ways – grilled and raw – with house cured duck ham, folds of thinly sliced kohlrabi and balls of uncooked English peas. It was a good dish but not perfect. Much as we loved the sheerness of the ingredients, the dish could benefit from some hydration, be it a drizzle of olive oil or a dash of light dressing. For mains, there was a choice of leek ash dusted French quail with leg kiev or mackerel with carrots in a Japanese inspired sesame dressing infused with soya. 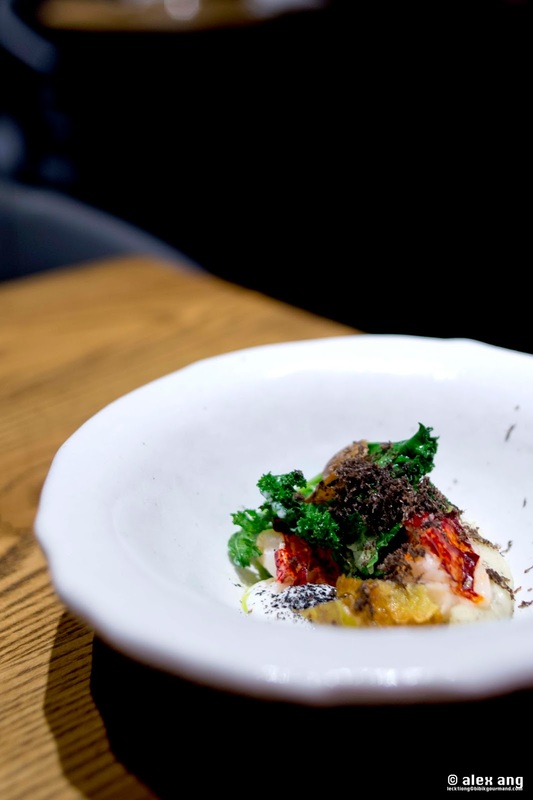 Both were positively decent but overshadowed by an off-menu lobster-inspired colcannon dish that Walsh serves exclusively at the chef’s table (chef’s table is priced S$150-$180 per head including Champagne and caviar). The chef’s take on colcannon, a traditional Irish dish of mashed potatoes with kale (available on the vegetarian menu), arrived as ratte potato puree deftly matched with a petite but plump hunk of lobster poached in its own “milk” (roasted herbed lobster shell infused with milk and buttermilk). Served in a shallow bath of chervil oil alongside a dollop of deliciously pungent horseradish yoghurt, the dish was beyond reproach. If we had a choice, this would replace either the French quail or mackerel on the set menu. 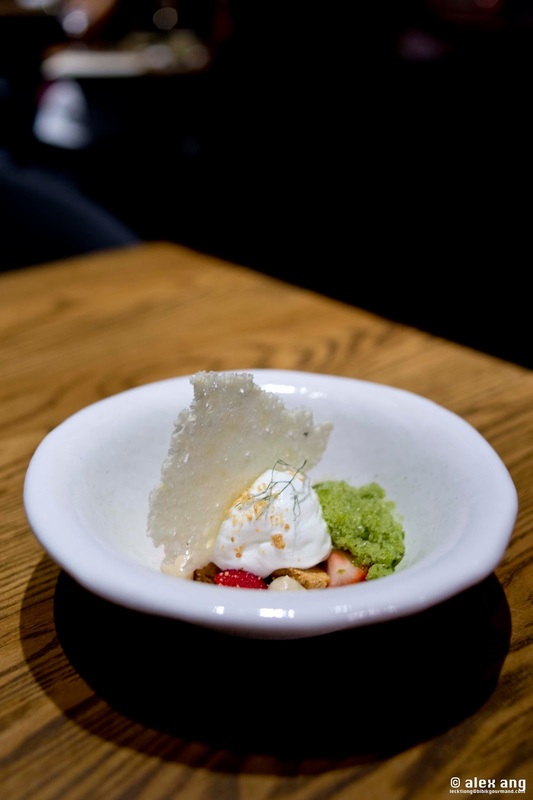 Trailing not far behind was the dessert of “strawberry and cream” – yoghurt, strawberries, fennel granita, dehydrated milk skin and shortbread – a perfect balance of sweetness and creaminess, with a gentle buffer of acidity. Best of all, it wasn’t overly fancy. But the rave is not without reservation. Admittedly, it’s still early days and the restaurant is still coming to grips with its first few weeks of operation but there are minor tweaks – be it the right dressing or simply a lick of char on the protein – that will propel some of the dishes from “decent” to “good for a return trip” or even “worthy of a detour”. With Walsh’s strong track record, it’s an easy fix.